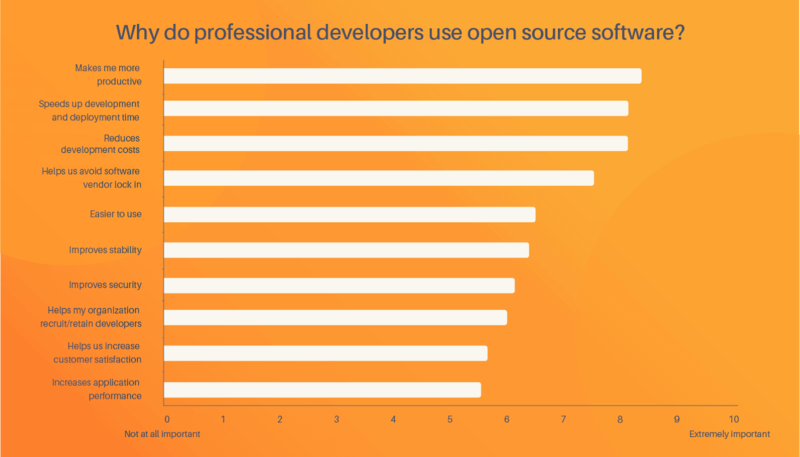 The professional open source survey results we published last year highlighted the impressive reach of open source usage among professional developers. We discovered several interesting data points, including that over 90% of professional developers use open source in building their applications. 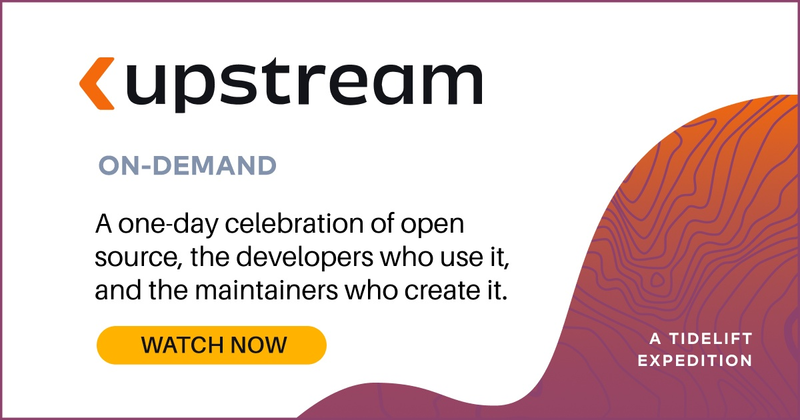 We also discovered that open source maintainers, when paid, will work on the very same things professional developers want more of—including predictable new features and releases, responsive security fixes, and more. In our latest survey, which we ran in November and December of last year, we set out to answer some of the follow-up questions that arose after we analyzed the earlier results. Nearly 300 developers responded to our survey, which dives deeper into how professional developers use open source today. We’ll take a closer look at the top three benefits of using open source below. Developers rank the productivity boost open source gives them as its biggest benefit. For professional developers, whatever reduces the amount of time it takes to complete a task, or that results in more output—without hurting quality—increases productivity. Almost 40% of developers rated this benefit a “10” on a scale of 0-10. Survey respondents’ comments reveal how open source makes them more productive. Certainly the great functionality open source packages provide is important, as expected. Equally important is the efficiency gained by collaborating upstream and the ability to go beyond documentation to see the code and exactly how a package operates. Open source provides an existing solution to avoid creat[ing] something from scratch. Ability to issue fixes to bugs found, and fix them at source rather than downstream work arounds. Can read and understand the source code so that if the documentation is bad for an API call, I can trace what's happening myself. Accelerating development and deployment ranks as the second most important reason developers use open source. Productivity and velocity are related concepts, though not identical. Where developer productivity addresses the output per developer, velocity more typically applies to the speed of a team working together. Interesting, less developers rated this a “10” on the 0-10 scale than either “open source makes me more productive” or the #3 response, “open source reduces development cost,” but overall responses were still heavily weighted toward 7-10 ratings. On its face, the third most popular benefit of using open source—reducing development costs—requires little explanation. But we dug into respondents’ comments, we saw multiple interpretations of what this means. Interestingly, almost 43% of respondents rated this benefit a “10” on the scale of 0-10, which was the highest “10” rating of any benefit we tested. Interestingly, none of the options we provided scored less than 5 on a scale of 0-10—that is to say, none of the options we provided are unimportant to developers. Among the other benefits that our survey shows really matter to developers are helping avoid vendor lock-in, which was rated the 4th highest benefit. Ease of use, improved stability, and improved security all grouped fairly tightly together in the 5th through 7th spots. We also gave respondents an opportunity to write in benefits that we might have missed, and many of them noted traits like collaboration, sharing, freedom, transparency, and community as important reasons why they use open source. We like the idea of a community of coders that build software for everyone's benefit. Ethics. Collaboration and cooperation, rather than roadblocks, helps the world progress. I believe in open source/open content from an IP philosophical perspective. I believe in the moral mission of open source software. Creates internal incentives for transparent and ethical behavior, and framework for accountability (i.e., helps build internal culture). Helps leverage and build ties to community beyond the organization. Promotes commons culture broadly. Attracts problem solvers to consider questions that are important beyond our organization. Showing good code that works, for others to say 'wow' —will definitely make you happy! So open source will always be the tool for growth. Helps everyone to make better code. Our new survey results also reveal new insights about concerns developers have with open source. We will pick up on this point in the next blog post. If you’re interested in hearing more of our findings over the coming weeks, be sure to subscribe to updates from the Tidelift team and follow us on Twitter.